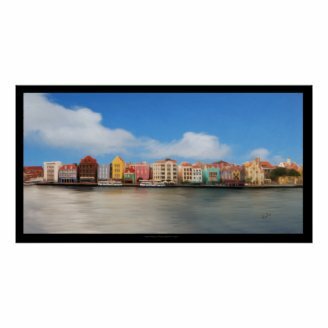 Do you want to see Willemstad, Curacao as it's meant to be seen? Then take a walking tour through this charming Caribbean port. 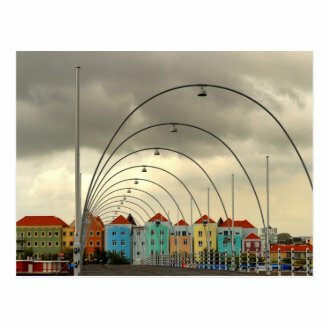 Willemstad is like a bit of the Netherlands brought to the tropics. Pastel-colored Dutch-colonial buildings with gabled roofs line many of the streets. You might, for just a moment, think you are in Amsterdam, until you notice the palm and divi divi trees growing on the sidewalks and in little courtyards. This Caribbean port really lends itself to a walking tour. Within a very small area you can see a floating food market, a restored fort from the 17th century and a lot of statues and monuments. Although this city of 140,000 people is often called "cosmopolitan," that seemed like a stretch. Quaint is a much better word to describe this multi-cultural community that lies just off the coast of South America. As with the rest of the Caribbean, there is a distinct West Indian culture, with little hints of its European roots. Its main charms lie in its distinctive architecture and compact size. The island of Curacao was once populated primarily by Arawak peoples, until Spanish explorers landed at the end of the 15th century. The native population was decimated. Many were enslaved and perished under the harsh working conditions. Some of these people were also taken, involuntarily, to other Caribbean islands. Then, in 1634, the Dutch began their occupation of the 171-square mile island. They ruled it for nearly 200 years, and left a distinct imprint in the form of colorful gabled buildings, and, to a lesser extent, on Curacao's culture. Curacao, until recently, belonged to the Netherlands Antilles, a group of Caribbean islands with their own government. However, it's now considered a sovereign state within the Netherlands. We arrived in Curacao on a cruise ship, which docked in Jan Thiel Bay on the eastern half of the island. Most cruise ship passengers, however, sail right into St. Anna Bay, which cuts through the heart of Willemstad. Because we were so far away from the city, we needed to take a taxi. Upon arrival, we stepped out of our cab and proceeded down a storybook-like side street that had a cute Dutch name. A long line of locals had already formed outside a casino that hadn't opened yet. A trip through an alleyway brought us to a courtyard lined with boutiques and restaurants. Although I wanted to browse, my husband saw something else. He spotted a casino that sat at the mouth of St. Anna Bay. After a few unsuccessful rounds of blackjack, he decided to call it a day and proceeded to tour Willemstad. Once we left the casino, we stood in the Waterfort district, which contains the buildings that house the municipal government, as well as many shops geared towards tourists. There is also a fortress, built by Dutch settlers, to ward off foreign invaders. It contains cannons that still point out to sea, just in case. This is where you'll also see a lot of statues and monuments that give a clue to the city's past, as well as the various cultures that have had some influence. There's one statue of the late Queen Wilhelmina of the Netherlands. Another statue is a gift from the nearby nation of Venezuela. This is of local hero Manuel Carel Piar. Waterfort is also where a self-guided walking tour, designed for visitors, began. This hits all the major attractions. We pretty much followed it, although this wasn't our intention. Next, we stopped at the floating produce market. This is where vendors from Venezuela sell fish and produce to the locals. Since Curacao has a desert-like landscape, it doesn't lend itself to agriculture. That's why a lot of its food must be imported. The boatmen line their boats up in a row and sit under their brightly colored sails, which shield them from the unrelenting Caribbean sun. Then they return to South American, to restock, when they have nothing left to sell. Tourists are advised not to eat this produce because they run a high risk of illness, since they have no immunity to the strains of bacteria found on the fruit and vegetables. Later in our journey, we crossed the famous Queen Emma floating bridge, which stretches across St. Anna Bay. This connects the commercialized Punda region with the "Otrabanda," which means "the other side." The bridge bustles with activity at all times of the day. However, if someone needs to cross to the other side, and a ship is arriving, they'll need to wait, since the bridge cannot be used by pedestrians until the ship passes through. As you walk across the bridge, you can feel it riding up and down from the water underneath it. You must quickly steady yourself, or else you could easily lose your balance. 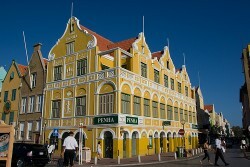 Although Curacao has higher standards of living than in many parts of the Caribbean, the Otrabanda was more run down than the rest of the City of Willemstad. We passed by an ugly municipal utility plant and a hospital complex before heading up an alley. This was a part of the city that many tourists probably don't get to see. This narrow passage was flanked by one-room houses, all built in the Dutch-colonial style. Each house had a large open window facing the alley we were walking through. We could see residents cooking and sleeping. One family was crowded around a tiny television set in a cramped living room. Since we felt a little like we were invading their privacy, we quickly moved on. Our city walking tour was complete. We decided to end our stay in Curacao by walking along one of its beautiful beaches. Have You Ever Been to Curacao? Hi Mira, that's what we were told, so we didn't want to take the chance. My husband, years ago, had one sip of a Margarita in Mexico and suffered greatly. It was the ice in the drink that nailed him. Monsterrat island in the Caribbean has an Irish-Caribbean beat, as it was settled by Irish immigrants. This beautiful little country, nestling on the shores of the Caribbean Sea is a veritable Paradise. In Toledo there are Mayan, Garifuna, Creole and East Indian people and others.